My poor hubby. He really dislikes piles, and yet he married a gal who’s just a little bit “out of sight, out of mind”. Thus, I’m a piler. All through the Christmas holidays, there was one particular pile that continued to be moved around from table to table, dresser to desk, and back to the table again. I am thrilled to announce, though, that the pile is soon to be completely gone as I am nearly done my recent recipe overhaul! My recipe organization has been a two part process. Yesterday I hinted about one aspect of it that I will share today, which is my favorite meal lists. Using my lovely ListPlanIt lists (did I mention I love these lists and that there just might be another giveaway coming up soon? ), here is what I’ve done. These are my Beef and Chicken Recipe lists. I know you can’t see it really well in this picture, but the left hand column lists the recipe name, the middle column tells me where to find that recipe (my recipe binder, the name of a specific cookbook, or if there isn’t really a recipe, rebellious cook that I am), and the right column is for any notes about that particular recipe (variations on it, things to serve it with, whether hubby really loves it, etc.). The beauty of these lists is that when I need to come up with a recipe including chicken, I don’t need to rack my brains to try to remember which chicken recipes I have and like. One quick glance at my handy dandy Chicken page and I can find a recipe that suits my needs, and I know exactly where to find that recipe as well. My Soups and Stews list shows off another fun feature I added in. The “C” that is circled to the left of my recipe names denotes a recipe that is crockpot friendly! I’ve even thought of adding another page of purely crockpot recipes, which would be such a nice reference for my meal planning when I have days coming up that I know will be busy and could use the ease of a ready-made meal at 5:00pm. Want to Make Your Own Favorite Recipe Lists? I dumped all the recipe cards out of my recipe binder. Threw out the ones we don’t like and never use. Re-sorted all the ones that are actually healthy and tasty into organized piles according to type of recipe. Used these recipes and my previous list of favorite recipes (which I made about 1 1/2 years ago) to start compiling my lists. For those who haven’t done this before, you will need to do a bit of extra work to get these to completion. If you’ve never made a list of your favorite recipes before, then you will need to spend some time going through your beloved cookbooks and any recipe binders/card holders that you use, so that you can make a list of everything you love and where to find it. This was my 3rd time creating lists like these (over the course of about 5 years). Every time it gets easier and faster. The only reason it sat around a lot this Christmas season was because I was struggling to find the time to actually sit down and finish it up in the midst of our activities, and because I wanted it done in a neater and more organized fashion than it had been before. Once you’ve made your lists, there are two options for using them. One is to actually put them in your recipe binder and add tabs onto them, making them into binder dividers for the different sections of your binder (if you even use a recipe binder like I do at all, which I’ll show later this week). 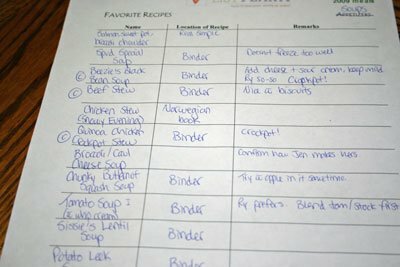 The other option is to include them under the Meal Planning section of a homemaking binder. Yesterday I re-worked my homemaking binder because I wasn’t using it the way that I had previously set it up. Now it is going to function as my Monthly/Weekly/Daily planner, as well as hold my Meal Planning pages, my Blog pages (future blog posts, to-do’s, advertising management, etc. ), as well as some other household management areas. I’ll get to the homemaking binder in a few more weeks, though I will let you know throughout this organization series whenever I do something that is being added to the binder. 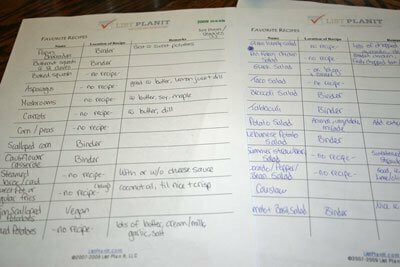 I love having these favorite recipe lists with my Meal Planning pages in my homemaking binder, but I’m thinking they would be right at home and very useful in my recipe binder as well, so I think I’m going to photocopy them and then I’ll have them for both purposes. Only thing about that method is that if I update one with a new recipe, I need to update the other! 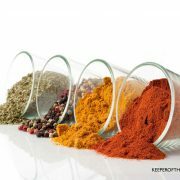 More to come on making your recipes organized and stress-less later this week! Do you have a special system of organizing your recipes? How do you keep track of your tried-and-true favorites? Thanks for this series–I am working on my first homemaking binder right now I and though it is time consuming I think it will be worth it (plus I like to do it, so time consuming is also fun)! It’s helpful to know that you re-do your lists and routines so often–that way I won’t get discouraged when mine isn’t working for me anymore in a few months and I have to do the same. 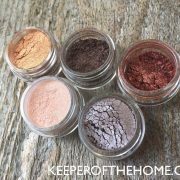 I’ve just recently discovered your blog, and it has been such a blessing and inspiration! 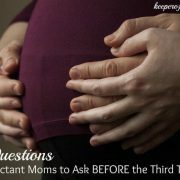 Thank you for sharing the wisdom you have gained about being a God loving wife and mother! This is such an awesome idea . . . and I would add a “Meals to take to others” list for new babies and other such events! I have a cookbook binder thingy…lately I barely cook but it’s always good to be organized! .-= sandy toe´s last blog ..All because of a hamburger… =-. The first should be completed by Wednesday. Your post came just in time for my recipe organization. Thanks! This is a great idea! I’ve been struggling when trying to organize my recipe binder. I love this. I am going to sit down today and create some lists like you have done. That is a great idea! Organizing my recipes is one area that I definitely need to work on. I am going to get started today! This is my last week of work before becoming a stay at home wife (and soon to be mom). One of my first tasks once I’m home full time is to make a homemaking binder and revamp my recipe listings and organization so this post was perfect timing for me. .-= MacKenzie´s last blog ..I Like to Move it =-. Ok… now can we see your actual favorite recipes? 🙂 Would love to know, it’s always a struggle for me to come up with what to eat. I’ve been enjoying reading about your recipe organization and menu-planning! Something I need to improve on, too. @Anna, What, you mean pictures that are actually close-up enough to read what’s written on them? 🙂 I will do my best! I am eyeing your lists and wanting your recipes! LOL. Wish I could just pop on over and flip through your binder :). I need to finish my lists, that I started in a similar way a while back, and never finished…its so close to being done that its been working but not perfectly. I made a big list of the meals that work for each thing we plan to have each week. Like a list of chicken meals, a list for beef, a list for crockpot ones, etc. Its also really handy to have the list for freezer ones, and the list for last minute ones too. I like the comment idea about a list of ones that are good for taking to others, but also one that is good for making for company would be good too. This way I can also see what areas I really need to find more recipes for, and then set aside time to hunt down and try some new recipes for that area, if things get unbalanced. I then put the individual recipes all in plastic sheet protectors in a binder, in sections for beef, chicken, vegetarian, etc etc. There might be soups in the beef, chicken, and vegetarian ones, or crockpot ones in each of those too, etc but the list I mentioned above sorts that all out. Works well. I’m a piler as well 😉 I know it drives my hubby nuts. I keep all of my recipes in a spiral notebook. That system works pretty well for me. Great post! I just found your blog and love it! Hopefully it will help keep me inspired to get more organized (a New Year’s Resolution). .-= April´s last blog ..Tuesday Random Thoughts =-. Thanks for the idea. I have a drawer which holds “my pile” of recipes. I like the idea of the list. It would be helpful in oh so many ways. Thanks again! @Allison, Yes, I totally did! My life is a whirlwind this week, but I am still planning to make them available to you as soon as I am able to. Thanks for asking! I needed the inspiration to work on organizing my recipes. I am also very interested in a homemakers binder. I don’t have one, but I think it would be helpful. 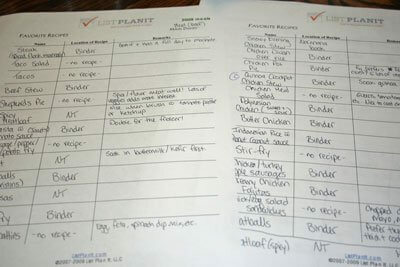 Does the check list planit have a type of outline for a homemakers binder? .-= Jodi´s last blog .. =-. Ugh…sometimes it’s so hard to get back in the habit of stuff. 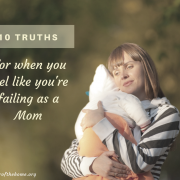 Things fell by the wayside some when I got pregnant and more when my little guy was born. However, he is six months old tomorrow…so no more excuses!! I started getting things organized into a household notebook on New Years Eve, but it’s still a work in progress. I really need to go ahead and try out the recipes I want to try out and if I like them, then I need to copy them over to google docs and throw the little scraps of paper they are on away!! Today is a menu and grocery list planning day. I’m hoping to get at least through the end of next week planned out!! My box has coupons, a pricebook, and menuplanning all in one. That way, if I’m at the store and see a good deal on meat I can sneak it into my plan and have a list of everything I need for it right there in the store. I use a recipe box with the usual categories for my “favorites recipes” which doesn’t work very well when hubby gets in the kitchen on Saturdays–somehow all of my soups and entrees and side dishes end up merged together. I have a binder that has my menu planning lists in it, information on cooking methods for various cuts of meat, notes where to find hard-to-find ingredients, and recipes I’ve pulled from the internet not in any particular order. As soon as I try a recipe and like it, it goes into my recipe file box. My menu planning lists are different in format than yours. I knew my schedule for each week consisted of having an easy to make meal for Mondays (with no left-overs) and cooking meals on Tuesday and Thursday that do have leftovers for Wednesday & Friday. My husband cooks on Saturdays and he makes something that has leftovers for Sunday. So my planning list consists of easy meals for Mondays and the more involved meals for Tues/Wed. & Thurs/Frid. Beside each meals I would put a B-beef, C-chicken, P-pork. Then I would have a list of our favorite sides (different ways of making potatoes, rice, and cooked vegetables). This was working OKAY until my husband was diagnosed with celiac disease. I felt like I lived in the kitchen because we didn’t buy very many “convenience foods.” Then I had to learn how to cook all over again–not that I was a very established cook to begin with. I no longer use my planning lists because my husband suggested and encouraged me to cook 1 meal each week and make enough to feed us for the whole week. Now, I have to say that I wasn’t sure that I could be okay with the same thing for a whole week, but I jokingly told myself that it could be a way for me to not eat too much because I’d be bored with the same meal that many days in a row. I didn’t have high hopes of there being any benefits to it either, but as it turned out, I really like doing it this way and while it may not be for most people, it does seem to work for us. Mondays are still a meal with no leftovers (lends itself to fish meals–I’m not big on fish, much to the dismay of my husband). I use Monday for my meal planning, shopping, and cleaning and preparing fruits/vegetables. Tuesday is my day to cook all day if need be and get Thurs & Fri meals into the freezer. I pull out Thursday’s meal on Wednesday, etc. -for some reason when I made my list I had it all “figured out” but when it came to actually doing the cooking–I had things that I couldn’t remember why I had it. The other benefit turned out to be that instead of freezing everything in individual portions, I started freezing things in comlete meal sizes saving a lot of time and extra washing of containers. Though I felt highly productive doing individual containers, I found that I disliked it because I had to have enough containers, label them all, then find room in the freezer for them (–never an easy task), then when frozen, organize them in the freezer so I can find them when I need them. I’m curious to find out what your household notebook is and what it contains. I may be changing some of my routines soon! Thanks Stephanie for you all the time and energy you freely give to us. 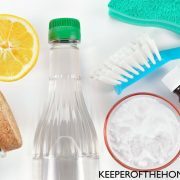 I consider myself to be organizationally challenged and it really helps to hear what others are doing to see if I can make it easier for myself. 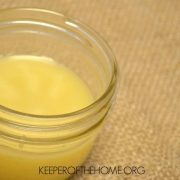 I have an added preservation category in my recipe box, for fermenting tips, freezing tips, and canning recipes. Just found your site and love it! One thing I’d like to see is your actual list of 21 meals and the recipes. Am I missing it somewhere? A few of the recipes are on my site, and some of them are from other blogs/websites. If there’s a specific one (or several) that you are looking for, just let me know! I can quickly import recipes from allrecipes and other sites just by putting in the URL of the recipe! I’ve put in most of my recipes and am making my meal plans each week. It provides a shopping list (with the meal reference indicators! ), then you can remove items from the list and even assign different items to different stores. Great for me since I shop at both Safeway and Costco!